Wash artichokes well and cut off stem close to base. Have ready a bowl of cold water with the juice of 1 lemon and some lemon slices added. If desired, stir in 2-3 tbsp. flour, as this is quite effective in preventing discoloration. As each artichoke is prepared, rub cut surfaces with a lemon slice from the bowl and place in bowl until all are prepared. Cook as soon as possible after preparation. Remove 3 or 4 layers of leaves until the tender inner leaves remain. Scoop out choke and pink thorny leaves from centre, using a spoon or melon ball scoop. Cut in half. In a large pan gently fry spring onion in oil until soft. Add juice of 1/2 lemon, water, approximately 2 tsp. salt and a good grinding of pepper. Bring to the boil. Drain prepared artichokes and add to pan with dill. Return to a slow simmer, cover and simmer gently for 30 minutes or until artichokes are tender. Stain cooking liquid into a pan and boil until reduced to half original quantity (about 1-1/2 cups). 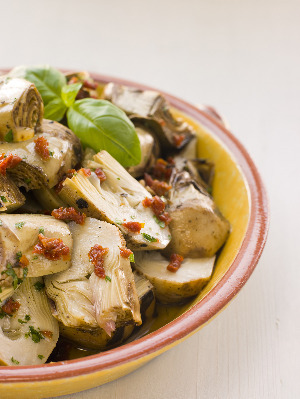 Keep artichokes hot in a slow oven. Mix cornflour to a paste with a little cold water and stir into simmering liquid. Stir until thickened and bubbling and leave to simmer gently. Beat eggs in a mixing bowl until light and frothy and gradually add remaining lemon juice. Gradually pour in simmering stock, beating constantly. Return to pan and stir over low heat for a minute or two to cook the egg. 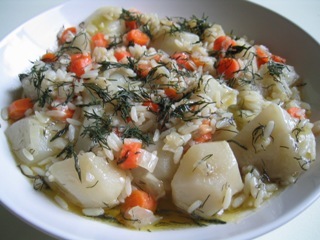 Pile artichokes on a warm platter, pour sauce on top and sprinkle with chopped dill. Serve as a light meal or as a first course.